Poster from Singapore's Anti-Child Ad Campaign. Bad Government Policy is Hard to Reverse. Today is the anniversary of Singapore’s independence, and they’re celebrating by urging citizens to make a baby. With headlines like “Thursday’s the Day to Go All the Way for Civic Duty in Singapore,” and a new commercial rap video produced by Mentos to “Get Your National Night On,” Singapore is fighting a battle with one of the lowest birth rates in the world. What a difference 40 years make. 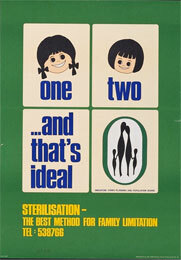 In the 1960s and ’70s, Singapore’s government was in the forefront of Malthusian fears (flavored with eugenics), with a population control campaign for residents—especially low-income and less-educated—to Stop at Two and then get sterilized (at right). China just might want to take notice. Oh, and we might want to take notice, too: is the Obamacare contraception mandate, rolled out August 1, a bit of the same? Maybe we ought to take a lesson from Singapore and reconsider: Big Brother doesn’t know best, and such decisions are best left to families.